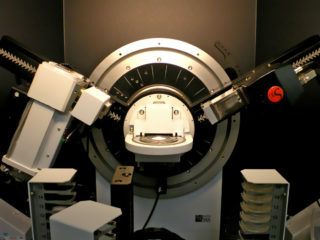 The D8 Advance is a high quality powder X-Ray diffractometer (XRD) with Bragg-Brentano configuration. It is capable of high through phase identification as well as providing high quality data for quantitative determination of phase concentration. Has three 15-position sample holders than can be loaded for extended analysis. Uses a LynxEye detector for faster pattern collection (up to 100 times faster) and improved resolution. Uses a copper X-Ray tube. Optional conventional scintillator detector available for structural analysis. Instrument is complemented with Bruker EVA software for search/match analysis and a comprehensive full pattern data analysis programme, TOPAS.